Stepping out into the wind after spending an hour on your hairstyle must be every woman’s nightmare… Our solution? If you can’t control the weather, control your hair! We’ve got five easy tips for you to try next time the wind’s out. Take that, South Easter! Apply some product and work through from your roots to your scalp. Smooth down your hair around the parting with hair spray and tuck back the front layers and “baby hairs” that aren’t nearly as cute as they sound. If you’re ready to embrace your inner Rihanna, the ”wet look” has become very popular and when executed properly it’s a great way to help you get through the day and protect your hair from becoming straggly and wild when going out into the wind. Create a flat, sleek look or twist the lengths of your hair while outdoors and undo when you’re inside. Effortless waves, hello? The wind is bound to mess up perfectly straight (or curly) hair – so why not go with a messy curl or tousled waves? The effect of the wind will only add to their texture and the overall carefree look. Apply some serum to ensure it still looks ‘kept’. If you just can’t bear the thought of windswept hair in your face and neck, wearing it up is your best option. A high pony works wonders, and so does a topknot or ballerina bun. A cute plait is always a sneaky way to cover up a bad hair day as well, and looks stylish. Luckily there are many protective styling tricks to choose from! A fringe is a nightmare to control in heavy winds, so it’s best to clip it back until the weather settles down. Be sure not to pull it back too tightly – it can look really sweet if it forms a small “bubble.” You could also channel your inner French girl and pin it to the side or create a swept-back French twist. It’s all about accessorising this season. If you have a collection of hair accessories, now is the time to use them! Hair bands, scarves, berets, clips, you name it – it’ll help keep your hair down in the face of the wind. Wearing that fedora may not be the best idea because running after a hat is not a good look in the wind. We’ve experienced it enough times to know. You’ve got this! 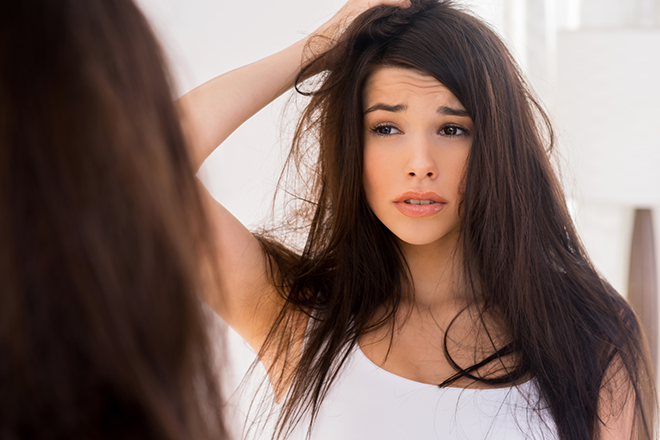 Share your hair wind-proofing tips with us! Topknots are always the best, plus they look cute on everyone.